China has formally initiated a mediation bid to ease Afghanistan's tensions with Pakistan and to encourage the two uneasy neighbors to jointly work for countering terrorism and promoting regional peace. Beijing's diplomatic offensive comes as relations between Islamabad and Kabul have deteriorated in the past two years over mutual allegations of sponsoring terrorist attacks on each other's soil. Chinese Foreign Minister Wang Yi traveled to Kabul on Saturday, where he met with President Ashraf Ghani and other senior Afghan officials to discuss ways to improve ties with Pakistan. An official statement later quoted Yi as telling his Afghan interlocutors that "if required, China will be ready to observe and explain steps" both Pakistan and Afghanistan are taking against terrorism and extremism. Earlier this year, diplomatic intervention by Britain helped ease tensions between Pakistan and Afghanistan. The mediation led to an understanding that the two countries develop a way to address mutual concerns and promote peace efforts. Ghani later proposed involving a third country to help verify efforts taken by the two countries to reach those goals, which apparently prompted China to undertake the current mediation effort as it enjoys good relations with both Pakistan and Afghanistan. A statement from Ghani's office quoted the president as saying, "Wang believes Pakistan has an influence on Taliban and will ask Pakistan to strictly control them, especially the Haqqani group." 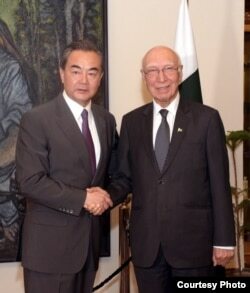 The statement also said the Chinese foreign minister had said he would urge Pakistan to commit to fighting terrorism. The Chinese foreign minister later arrived in Islamabad to further his mediation mission in talks with Pakistani foreign policy adviser Sartaj Aziz. It was not immediately known whether Yi brought with him any proposals from the Afghan side. "Both sides held wide-ranging discussions and overview on matters related to bilateral relations, regional security and the situation in Afghanistan," Pakistani Foreign Ministry spokesman Nafees Zakaria said. The visiting Chinese foreign minister is also scheduled to meet with Pakistani army chief General Qamar Javed Bajwa on Sunday before holding a joint news conference with Aziz to share details of their talks. Yi will then travel back to Kabul to brief Afghan leaders on his meetings in Islamabad, officials said. China considers stability in Afghanistan vital to its national security and economic interests. It is worried that continued Afghan insecurity could threaten security of its western Xinjiang province, which shares a border with the war-torn nation. Beijing is investing billions of dollars in Pakistan, China's staunch ally, to establish a trade route to gain access to international markets through the Pakistani port of Gwadar on the Arabian Sea. Afghan leaders allege sanctuaries and safe havens on Pakistani soil have enabled the Taliban to intensify insurgent attacks and prolong the Afghan war. Islamabad denies the charges and in turn says sanctuaries in border areas of Afghanistan are where terrorist attacks are plotted against Pakistan, including Friday's deadly suicide bombings in two cities that killed more than 80 people and injured more than 200 others. On Saturday, Bajwa alleged that militant sanctuaries in Afghanistan were operating "under the patronage" of the country's intelligence agency and its Indian counterparts. The army chief made the remarks while chairing an emergency meeting of his top commanders, according to an official statement released Saturday night. Bajwa dismissed criticism that Pakistan is not doing enough to counter terrorism. "Unfortunately, our sacrifices against terrorism are not well-acknowledged and we are often subjected to the demand of 'Do more.' ... It is time now for the other stakeholders, particularly Afghanistan, to do more," he said. Bajwa's remarks came days after the U.S. Department of Defense in its latest report alleged that the Taliban and militants linked to the Haqqani terrorist network continue to use sanctuaries on Pakistani soil for staging attacks in Afghanistan. Can Flourishing Islamic State Be Stopped in Afghanistan?